Most microscopes can be retro-fitted with a motorised focus option. The standard motorised focus control provides step sizes as small as 0.002µm and provides excellent resolution for precise focus and repeatable positioning in the Z-axis. For large movements or when speed is required, the ProScan™III focus motor can be driven at speeds of up to 20 revs/s. Our coupling system uses a ring adaptor to match our motor to almost all microscope which have a coarse and fine focus knob. Also available is a direct coupling (H122KON) adaptor which connects directly to the focus spindle of the microscope. For larger (generally zoom or macro) microscopes we offer a high power motor system to drive the larger weights involved. 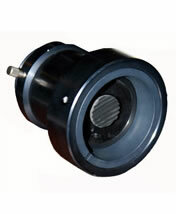 An optional probe style encoder feedback system provides the highest accuracy and repeatability available.